This version of the model covered World Cups, teams, stadiums and hosts but what was missing was the players who played in those matches. A Squad node which represents the players who were named to represent their country at a specific world cup. These nodes are connected to a specific WorldCup and have multiple Players coming in to them. A PlayerPerformance node which represents a player's performance in a specific match. This node has an incoming relationship from a player of STARTED or SUBSTITUTE. A Goal node which represents a goal that was scored in a match. This is connected to the PlayerPerformance node and also to a Team node to allow us to indicate which team the goal is for. I modelled it like this specifically to handle own goals but it does seem a bit over kill for normal goals. Instructions on how to import the data set into your local Neo4j are on the github repository. You can see have a look at all the scripts and the data set as well. GDP data - to see performance based on wealth. Maddison's Historical GDP Data could be helpful here. Club teams that players played for at the time of a World Cup - not sure of a data source for this? Let me know if you have other ideas and come along and join us on Wednesday if you're in London. Neo4j is a open-source, transactional, high performance graph database. Neo4j stores its data as graph, i.e. Nodes connected with Relationships. Its graph centric query language is called Cypher. 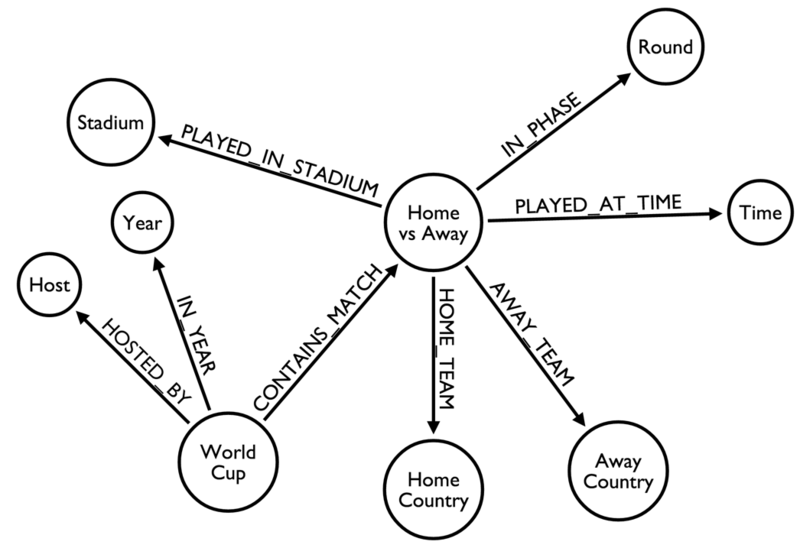 World Cup Fun with Neo4j © 2013 • All rights reserved.